Email Time Management Trick|Radiant Prof. Srvc. Companies and professionals live by the email box these days. The requests for information, the updates and requirements, the purchase orders and endless questions; they fill your box seemingly as quickly as you can clear them. There is no magic bullet for clearing the email box. The tools like spam filters are a mixed bag and unfortunately the definition of spam itself is somewhat unclear. One man’s spam is another’s marketing campaign. Anything short of hair restoration and dating sites are open to personal interpretation. But there is something you can do about the lion’s share of email at work to get them under control and keep them there. It’s not magic but it can make a big impact. Principally this is for the knowledge workers except for sales and managers but this can help most professionals. Regardless of your role, give this process a try and see if it doesn’t make a big impact on your mailbox. First the reason it works. How many emails do you have in your top level inbox right now? Now, how many do you have that need your attention? I am not talking about the ones tucked away in some history folder but actually right in front of you when you go to your inbox. If the answer is “I am not sure” then here is your first problem. Now, of the ones that require your attention, how many are duplicates? And, how many have been waiting for more than a few days and are “follow up” queries? See the problem? If you have duplicates then you probably waste time going back and forth searching. If you have emails needing your attention that are mixed with general emails, there is the other half of your problem. Take an hour, day or weekend, and move each and every email that has been attended to, into a folder that gets it out of the way. Either the Trash folder, or some other folder organized in whatever way makes sense. For each email duplicate that still needs attention, move the earliest versions to the appropriate folder (including the trash bin if appropriate). Keep the most recent version in the top. For each remaining message (and it should be considerably fewer than what you started with), reply to the sender with a firm commitment to when you can answer them. This will have two part effect: (a) it will help them know you got the message and are planning to respond – building good will and (b) it will keep them from sending another request reminding you of the first one. Immediately set a flag on that message with a follow up date. 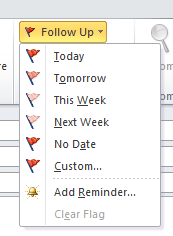 In MS Outlook you can do this by right clicking on the Follow up flag usually found in the email message as well as in the list view. You can even set a reminder which is very helpful, especially starting out. Now one obvious concern may be, I get to the date I set the reminder for that email and I cannot respond to it. Typically there is one of two reasons. Either I am waiting for something from someone else. In this case, simply use this reminder to reach out to that other person (and suggest they use this trick) and then update the original messenger. Finally, reset the reminder with a new follow up date. This resets the clock but you have honored your commitment. But what if that was not the reason I cannot close out this issue? In many cases it is not that I am waiting on someone else, but that I simply do not have time to respond now. If this is the case, still notify the original messenger that there is a delay and provide a new date – but only one you really can make. If there is no way you can get to it – then tell them so they don’t keep emailing you and filling up your mailbox and wasting your time. And perhaps that is the secret to time management after all – to not take on a commitment you know you cannot keep. You waste time and burn trust. This article is an extract from the coming book on business communications ….watch for news.